I'd be interested to see how this differs from ReviewClipse, and if it makes sense for you to collaborate with them? @David I've seen the proposal and there appears to be a few screenshots of the tool in the linked powerpoint. From what I can see it doesn't focus on the comment UI like we have done. It it might still be interesting to collaborate - but of course we're a commercial company and don't want to release everything as open source. Looks great! How do reviewer comments get into your Eclipse session? Is there a central server that collects and distributes them (and, perhaps, review requests)? No central server. Review information is stored in an xml file and you simply check it in/out from your source control system. @Chris. Simple and low-tech. I like it! just fantastic ... it sounds really interesting. is there any more concrete plan than "we plan on pulling it out into an independent product" ? and is the timeplan something like "oh we really should do it sometimes" or like "ok - shipping next week" ? 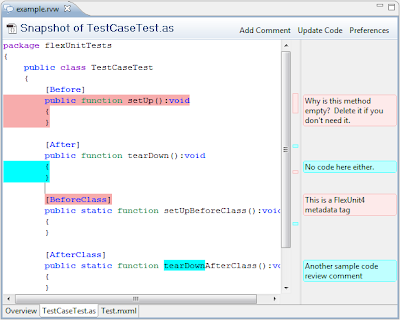 Yes it will be a pure Eclipse plugin. No server, no other special requirements. We don't intend to release it as open source. We will make it commercially available, but likely for a rather low price point. As for when it will be available, likely within the next 6-12 weeks. Love it! Local xml files that you can put into SCM is a great solution. I've looked at/demo'd some web-based tools, but imo much better to be simpler and avoid the server piece and corresponding deployment and complexity. Simply awesome!! I'm really looking forward to see you releasing the stand-alone version. That's exactly what we were looking for for a long time. Have you thought about ReviewBoard integration? We haven't thought about integration with any other tools as of yet. Right now we're focused on making it a.) have a great UI and b.) be as simple as possible (i.e. just a plugin installation, no server, no other requirements). 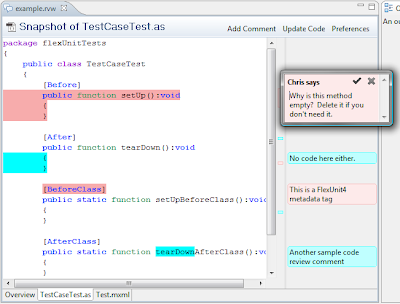 Pretty cool, when will the code review editor be available? Will this be a free plugin for eclipse? hey chris, i just want to say thank you for the tool. it easy, and it work.